We’ve been saying it for years – “Read the preamble!” A slightly more careful reading of Pilcrow’s pre-ramble (well, it was a bit of a preramble this time) would have saved us some ultimate head-scratching. Two significant words there escaped our original perusal: ‘said’, and ‘nominally’. More of those later; first I had to check that Pilcrow hasn’t resigned his membership of the Listener Setters’ Imbibers Fraternity (sorority – whatever!) and what do I find? Barely a trace of alcohol. There’s a ‘Drop from trea[C]le say, lump under acceleration due to gravity (4)’ giving G + LOB, then ‘Maybe stee[R]s stomachs, containing arsenic repulsed by a medical man (5)’ A MO< round As, but it’s a fairly gloomy set of surface readings. Things ‘flounder’, are ‘taken aback’, are ‘rough’ and ‘old’, ‘deficient’, faceless’, incompetent’, ‘tortuous’, ‘shortened in recession’, ‘snubbed’, ‘conceal crime’, and are ‘infested by forgotten bedbug’. Rather an ominous start to solving if Pilcrow was in that sort of mood! Solving began anyway and the bottom left hand corner of the grid quickly yielded producing a rather strange ?YOT. That gave us three possibilities: RYOY, EYOT and PYOT and we went off on our first red herring – well, a black and white one, actually since the title was ‘Black or White’ and the Magpie (PYOT) is both. Were we in bird and animal country? We continued to solve and the gloom was relieved when several words of a message appeared: ‘LORD MAKE ME AN INSTRUMENT OF THY PEACE’. That was Saint Francis of Assisi wasn’t it? Perhaps those other strange words that were appearing: WO?, ?OO and FOR? were going to be some kind of animals (WOL and ROO of A.A.Milne fame?) The significance of that ‘Nominally’ in the preamble took some time to creep to the surface of our solving processes. There was one more evil little word in the preamble. We had to find a series of five unclued entries and SIXTINE was clearly defined as one of them. 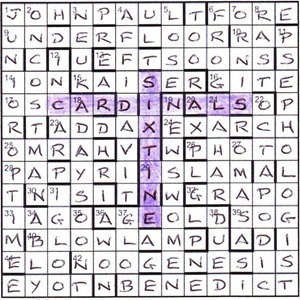 With a grumble (well as a northerner who pronounces nothing the same way as you lot from down south, I haven’t a second’s patience for homophones, whether or not Chambers justifies them) we noticed that the hidden word CARDINALS was descriptive of the SAID (my caps.) five entries. So we filled our grid with WON, TOO, FORE, EYOT, SIXTINE and muttered a groan of thanks to Pilcrow. That was graceless, wasn’t it! 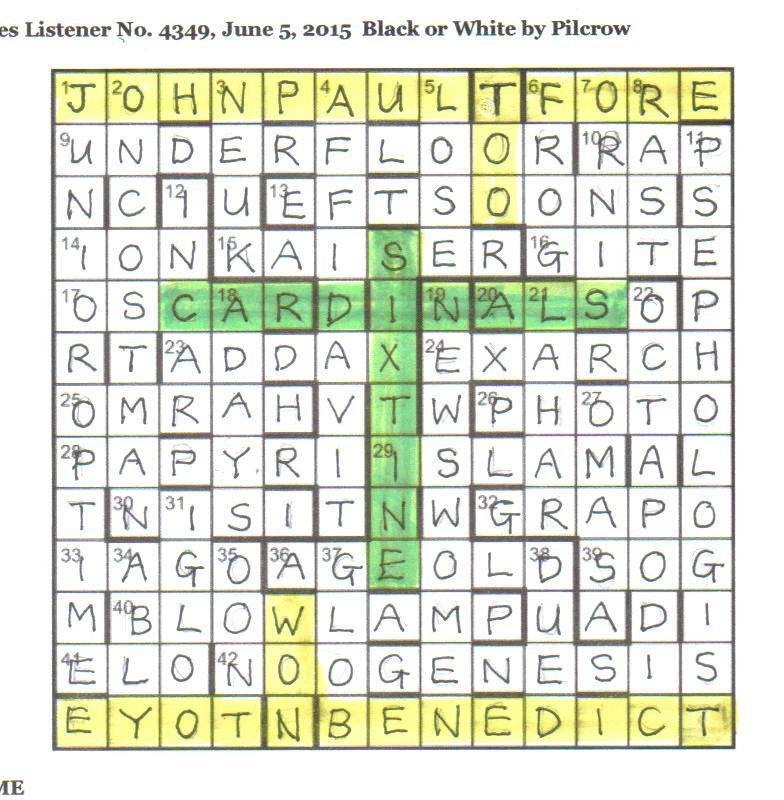 Thank you, Pilcrow, I liked the Saint Francis link and solving was fun. Three years since Pilcrow’s last outing with its Arsene le Wenger / Arsenal Manager theme. Before that we had a thoroughly entertaining puzzle with its 16×16 grid but only seventeen clues! This week, we had to find a series provided by five of the unclued entries. The clues provided misprints aplenty and wordplay omissions afew, although some omitted two letters. I noted with interest that a hidden thematic nine-letter word was descriptive of “said” five entries. 11dn Political analyst, Liberal going through tortuous hoops on point (12) on the other hand was the slightly easier PSEPHOLOGIST. Having watched the election coverage in the 60s and 70s, I was familiar with the swingometer gurus like Robert McKenzie. (This clue also contributed PE to the thematic person.) It didn’t take long to slot in 10ac RAP and 16ac GITE, although none of the other words ending in this right-hand column were as easy. I decided to have a go with the acrosses on the other side of the grid. 9ac Flounder about with metal beneath tower support (10) would have to wait until later as I was unsure if the misprint was for “flouncer” or “towel” or, indeed if it were a non-misprint clue. (It took some time to realise that it was an anagram of FLOUNDER + OR!) 13 looked as though it would be an anagram of O (old) STONES and could be one of the incomplete wordplay clues, but adding an F to give EFTSOONS would have to wait till later. 14 was more straightforward, with IRON (archaic word for safety curtain) – R for resistance to give ION. Another three letters got slotted in. I was getting somewhere, but very slowly. 17ac Sward on cliff (5) OSCAR came next. I particularly liked the latter’s surface reading and misprinted “award”. Answers were indeed coming slowly, but there were some excellent surface readings on the way to admire. I particularly liked Ships follow this current south and escape across the Atlantic (5) at 29ac which should read “Shias follow this” for ISLAM with I S + LAM for the wordplay. Eventually the grid was nearing completion, and the unclued JOHN PAUL and BENEDICT told me we were dealing with Popes. 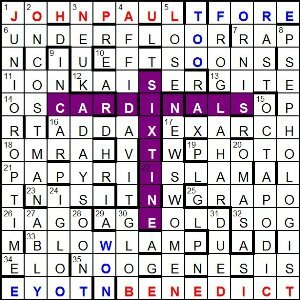 This tied in with the title which, I assume, referred to the black and white smoke that indicates whether the CARDINALS (in row 5) had decided who would be the next one. The corrected misprints gave Lord make me an instrument of Your peace, courtesy of St Francis of Assissi. Francis was thus nominally relevant, the current Pope Francis (spelled out by the wordplay omissions) being, surprisingly, the first with that name. There then followed fifteen minutes of bemusement. I had completely forgotten about the note to myself on reading the “said five entries” in the preamble. 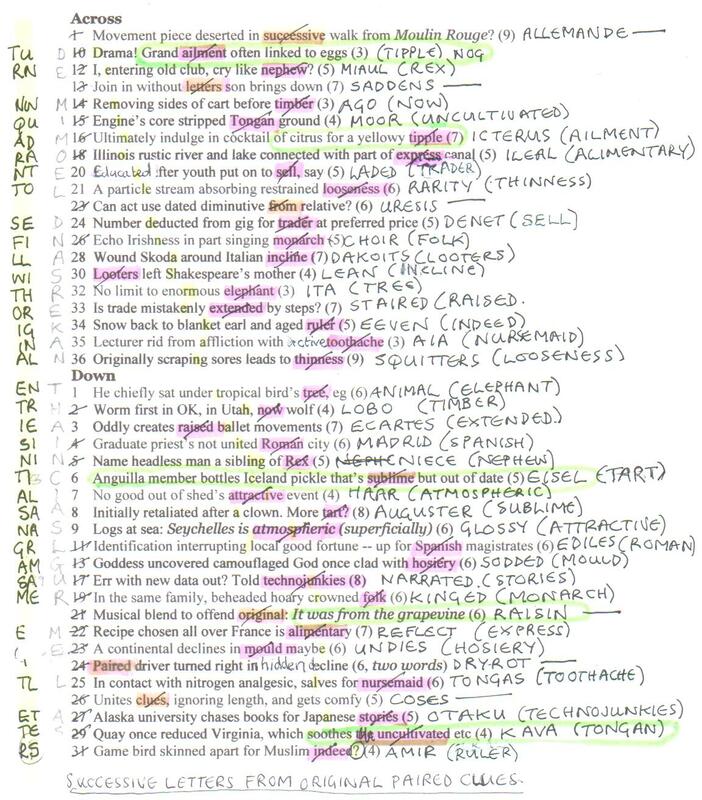 Although EYOT was fairly obvious in the lower left and SIXTINE (given for SISTINE in the OED) down the middle, the others had more than one option, and homophones didn’t immediately jump to mind. Of course, reading the preamble a couple more times, with its reference to Francis’s three predecessors, finally made all clear: WON, TOO, FORE, EYOT, SIXTINE for 1, 2, 4, 8, 16. How neat that we had had John Pauls I and II, and Benedict XVI immediately before Francis I. It’s almost as if it were deliberate! All was done and dusted, and many thanks to Pilcrow for a fine puzzle. A nice theme and, above all, excellent clues. I have had a number of requests for a setter’s blog, particularly several intrigued to “know how you approached the grid construction”. The problem is that after a few years I have forgotten exactly how I managed to construct this puzzle, but I won’t forget the blood and sweat produced to get there – that will be firmly etched on my memory. 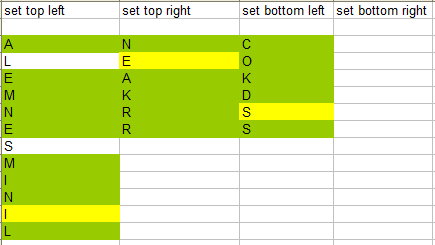 Just glimpse at the spreadsheet that I created whilst attempting to set the clues trying to make sure I didn’t make a wrong move (even that wasn’t foolproof). What I can tell you about the construction is that there were no fancy software programs used in this puzzle; I am not that computer savvy having no programming experience at all. 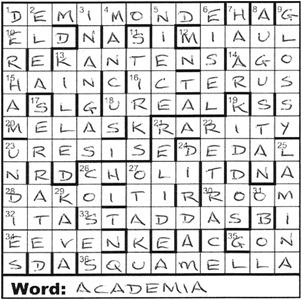 The idea for the puzzle came out of nowhere (probably at awe solving the amazing grid transformations produced by Kea to win his Ascot Gold Cups): but essentially I wondered if I could rotate a quadrant of the grid to a different place creating real words. At first I thought I could swap quadrants, but gave up on that idea as the puzzle would be over too quickly (those of you that have solved Shark puzzles are often faced with convoluted endgames). I worked on the upper left-hand corner and ANIMAL to LAMINA with MADRID to DIRDAM immediately came to mind. Because of rotational symmetry, whatever length went in one quadrant had to be the same in the other. So using six letter entries meant I didn’t have to worry about creating any further new words. I also knew I couldn’t use too many short words, despite their being easier to find, because the average word length would end up being too low. I noticed that ALLEMANDE would work with MADRID and that forced the bottom right-hand corner to be SQUAMELLA. ECARTES and RETRACE followed and it wasn’t long before I had most of my rotating quadrant filled. Starting to add bars to the remainder of the grid made me realise that there were going to be around 40 entries and, if I could make it such there were 36 numbers, I could use these letters to refill the blank space. Searching through my files I have found an early spreadsheet, but interestingly I have no recollection at all of doing it! Some of the letters were already fixed because of the upper-left hand corner as well as a few crossing entries, so I must have created a spreadsheet to identify what letters were forced before filling the rest of the grid. I refilled the top-left hand corner at the same time as I filled the rest of the grid and entered the bottom right-hand corner last as that had the most leeway. There are not a lot of 9-letter words that end with NDE and so using DEMIMONDE forced an M in the same place. A few more words in the refill were starting to be created and several “A”’s were appearing as duplicates. This was very fitting as I intended to make the solver refill the grid as a setting exercise and so ACADEMIA would make a perfect finale to the puzzle. As I went along I was saving the files as “quad” but ended up calling the puzzle “setting school” (see more on that later). However, would it be fair to the solver to refill it? There were two nagging doubts. Firstly, was the refill unique and secondly, could solvers actually refill it without losing their sanity. I asked Chalicea to have a go. So she sat for days, literally days, with 36 scrabble tiles and the blank corner of the grid with only the crossing partial entries as shown. At the same time I heard from Nod that Elap was a whizz with programming and he might be able to tell me if my solution was unique. He created a programme and left it running, working through 100 million possible fills for the above corner with the set letters, and came up with 5 solutions. However each of them had a word re-used from the original (apart from icterus, which was the only entry I was forced to re-use). As I had used ELEA, a proper noun (even though it is in Chambers under Eleatic), this proved that there was no fill using real words. There may well be another possible refill using proper nouns, but I had no way of proving that. Given that Chalicea was still struggling, made up my mind that I had to give the solution fill somewhere in the clues. On several occasions I have used cluing gimmicks that relate somehow to the theme. This time, as I needed so many letters to get a workable instruction, meaning two from each clue, I used movable definitions. Now I also had to include the refill letters somehow (originally I called them ‘staggered letters’ until Shane suggested I change this to ‘successive letters’). It was Artix who stated after test solving the puzzle, that what I had achieved with the 36 letters in the grid would slip by several solvers. He suggested I should take out the last clue’s hidden letter especially as that letter corresponds to an unch in the grid. I therefore re-clued it with the question mark at position 36. The 6 un-thematic clues coincided with the 6 entries starting from the same 6 cells in the grid as thematic entries and so these were used to guide the solver to the re-fill shortcut. From reading the feedback from JEG, I think the fact the 36 letters are the starting letters in the grid (and therefore the 6 un-thematic clues coincide with these) has slipped by several solvers. Artix also came up with the adjusted title changing it from “setting school” to “quads” as it tied in with the process of the movements of quadrants and ACADEMIA (given that quads or quadrangles are seen in places of academia). I kicked myself as I had called it this all along, but was fixated on the fact that I wanted this to be a setting exercise for the solver. That aspect didn’t matter anymore. Finally, I must thank all my test solvers who battled through the puzzle, giving much needed preamble suggestions. The preamble, as I have often found when setting and solving, can make or break a puzzle. Noticing some of the comments that have arrived from JEG, many solvers found this tricky, but rest assured, hours of consideration went into every aspect of this puzzle to make it as fair as I could make it. This took almost a year of setting, tweaking, vetting, adjusting and then over two years before further editorial changes were required, including several clue shortenings due to lack of newspaper space, so I am pleased this puzzle has seen the light of day and has gone down well with all the solvers who gave it a go. Shark indeed, half of last year’s Ascot Gold Cup winners team (with Nudd – co-setting as Rood): this is going to be a challenge! We read that long preamble and breathe an anxious sigh. What have we here? Part or all of the definition words in all but six clues is going to shift to another and vice versa, creating eighteen pairs. We have to use the first letter of the correct clue and of the clue it came from ‘in either order’ to spell out three instructions. Then we are given more information, clarifying the ways we must use those instructions. That’s plenty to be going on with – time to solve. Of course, I have to check that Shark and his co-setter have put that ‘Cup’ to good use so I quickly scan the clues to check that he still qualifies for the Listener Setters’ Imbibers Gang and find a boozy sprinkling of evidence. But what I actually find when we have completed our solve leaves me staggering drunkenly and wondering that Shark can stay sober enough to compile at all, never mind cup winners! 10 across, after we have moved TIPPLE from 16ac reads ‘Drama! Grand tipple often linked to eggs (3)’ giving, of course, NO + G = NOG – a healthy eggy start. But then, 16ac, before any adjustment gave ‘Ultimately indulge in cocktail of citrus for a yellowy tipple (7)’ (indulg)E in CITRUS* = ICTERUS (yellowy ailment). It sounds as though there was a move onto Limoncello (one of my favourites). 6d (after we have interchanged SUBLIME and TART) ‘Anguilla member bottles Iceland pickle that’s tart but out of date (5)’ giving IS in EEL = EISEL. We’re back to Bardish days here in Shark’s choice of a vinegary tipple. Fortunately he gets onto healthier habits with 21d, ‘Musical blend to offend [original]: It was from the grapevine (6)’ RAI + SIN (our French word for the source of all those litres – and an old grape). Well, ‘Cheers, Shark’. but no, he hasn’t finished. 29d (after pairing with ‘UNCULTIVATED) gives ‘Quay once reduced Virginia, which soothes the Tongan etc. (4)’ KA + VA. Horrid stuff that I thought tasted like dirty dishcloths but it is mildly narcotic too, isn’t it! Well, well, Shark! Doing all the pairing took us ages but eventually we were able to untangle three instructions from those initial clue and solution letters. ‘The first (five words) applies en bloc, overwriting part of the grid (with normal letter orientation) and leaving another part empty. We are being told to chop up our completed grid and glue it together differently. This is returning us to Jago wren or to Listener snowflake or Astaire dancing steps! We do as instructed. Astonishing! We find that that inverted quadrant has made real words when inserted into the south-east corner of our grid and reorient those letters. We are, however, scratching our heads in habitual Numpty fashion wondering how we are going to use the initial letters of those 36 paired clues to make more real words to fill that empty quadrant. What a huge task seems to loom. Fortunately, Shark has given us some help: there were those six unpaired clues that each contain an extra word describing ‘a way of finding most of the required material in the required order’. (my italics). We find SUCCESSIVE LETTERS FROM ORIGINAL PAIRED CLUES. That seems to be astonishingly generous of Shark when we realise that he has spelled out the letters (most of them) when we read the first, second, third etc. letters of clues. He isn’t going to let us off as easily as that! Now we understand the MOST. The 36th paired clue has ? at the end, to oblige us to check that we have used all the letters, since 11d could give STIRES, STIRKS or STIRPS. Clever Shark! STIRKS. Finished? No, we still have that final instruction: ANAGRAM SAME EIGHT LETTERS. I have found the one word that hasn’t changed, ICTERUS, but now, comparing my original and new grids, I find the letters MAAIADEC. That can give only ACADEMIA (so nicely suggesting the title, Quads, which, of course, is what we have been playing with). Dazzling! This certainly confirms Shark’s place among the masters. Shark’s third Listener, although he’s had a fair few Evs, Inquisitors and Magpies. The fact that his Magpie puzzles tend to have D (for Difficult) grades should be a warning to us all. The preamble told us that words in all but six clues needed to be swapped with their first letters spelling out three instructions. 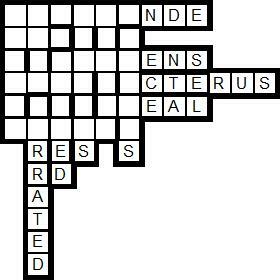 The remaining six clues had extra words that would help us even more. Well, all that play with words (as opposed to wordplay) meant that you couldn’t be sure what the definition was, and would have to rely on the wordplay (as opposed to the play with words) to nudge you in the right direction. I hurried through the across clues to see what I was up against. 20 LADED, 24 DENET, 26 CHOIR and 33 STAIRED were all that I got. Still, that was four more than I was expecting. It was good to see that the grid was nice and symmetrical — I only got four downs as well — 3 ECARTES, 7 HAAR, 9 GLOSSY and 11 EDILES. Back to the acrosses, and 1 ALLEMANDE and 13 SADDENS got me going nicely, and after about 90 minutes, I had 75% of the grid filled. OK, it took me another 90 minutes to make a list of all the correct words and the first letters of the clue each came from. This enabled me to finally resolve the outstanding clues, and I was home and dry. It was evident what the first instruction needed us to do, which the preamble told us applied “en bloc“. I was still gobsmacked when the first six letters from ALLEMANDE in the northwest corner flipped round onto the end of the first three letters of SQUITTERS (with its lovely ‘looseness’ definition) to give SQUAMELLA. Is that really a word?! It is — a small scale (as in lizard). 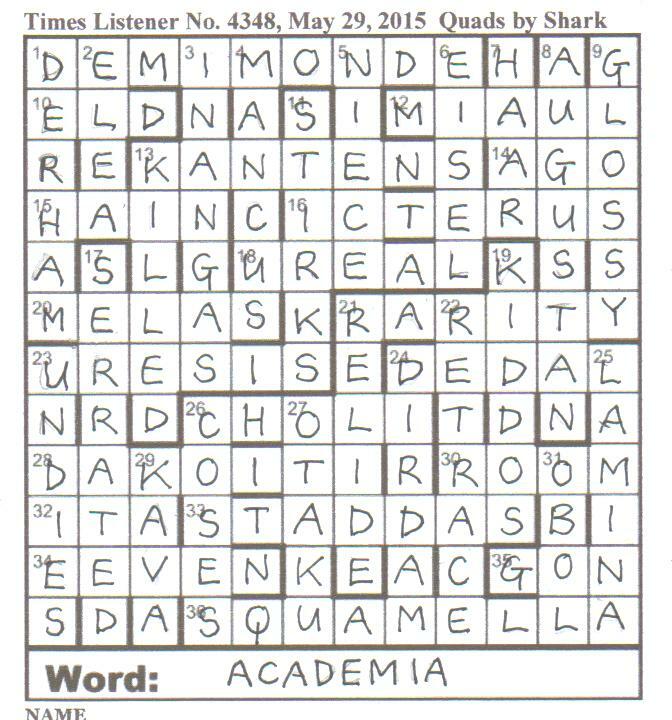 This left a gaping hole in the top left corner, and the second instruction told us to fill it with the initial letters of the original entries. Surely that can’t be right! Well, there were 36 squares that needed filling, and there were 36 numbered cells, so it looked as though that was exactly what needed doing. However, I had absolutely no idea where, or indeed how, to start. Even 1ac could become one of several entries — DEMI-MONDE, ASH BLONDE, BEAU-MONDE among them. Luckily, we were given yet another hint, as spelt out by the extra words. But what exactly does ‘successive letters’ mean? It was only a short while later that I found myself taking the first letter of the first unpaired clue (D), the second letter of the second clue (E), third of the third (M). Was I going to follow them with an I, an M and an O? I certainly was, and it wasn’t long before I had a full grid. Actually, not quite full. There was no thirty-sixth letter of the thirty-sixth clue (31dn). Instead I was faced with a question mark. I was thus left with an empty square in 11dn STIR·S. It could be STIRES, STIRKS or STIRPS. Going back to the initial letters of all the clues, I had accounted for all of them except a second K, so in went STIRKS. Lastly, the Word to go beneath the grid. 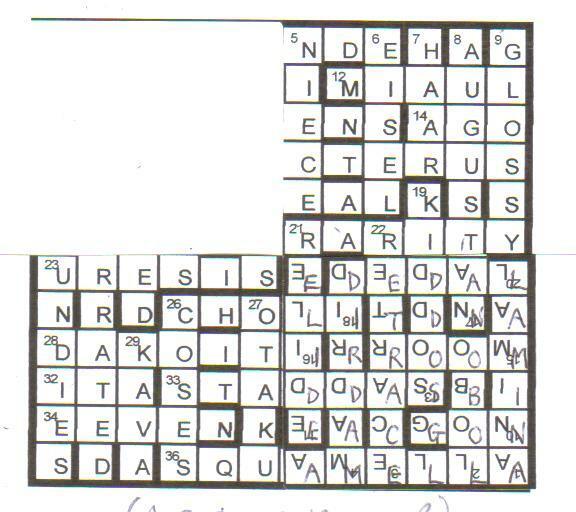 This had to be an anagram of those letters that were the same in the original and final grid. I have to say that MAAIADEC looked unlikely to be the anagram of anything! However, a bit of doodling enabled me to get ACADEMIA without any help from Sympathy. And so, after a long afternoon’s work, I was done. What may seem from this blog was a nice smooth progression from one stage to the next was, in fact, a series of stutters. (My blogs have a habit of compressing time wonderfully!) Personally, I think a better title for the puzzle would have been Phenominal. How Shark managed to weave all this complexity into a simple 12×12 grid is staggering. I am in awe. I feel lucky to have been able to enjoy the experience. Many thanks, Shark.